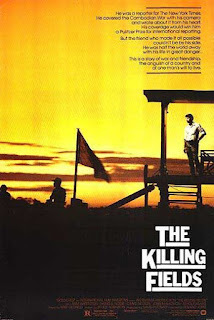 Tag line: "Every so often, there is a film that is destined to be talked about and remembered for years to come"
Set in Cambodia in the 1970s, The Killing Fields is a tale of survival set in the most extreme circumstances. New York Times reporter Sidney Schanberg (Sam Waterston) is a foreign correspondent working in Cambodia, where he covers the Vietnam War. His aide, Dith Pran (an Academy Award winning performance by Dr. Haing S. Ngor), acts as Sidney’s interpreter, and also gets him access to many restricted areas. The two work closely together, and become fast friends, so when the Khmer Rouge takes control of the country, Sidney makes arrangements to get Pran’s family out of Cambodia (Pran remains behind to continue assisting Sidney). After several close calls, Sidney and Pran end up at the French embassy, and, with the help of photographer Al Rockoff (John Malkovich) and British journalist Jon Swain (Julian Sands), attempt to forge a passport so that Pran can leave Cambodia. But their efforts fail, and Pran is instead shuttled off to a labor camp. Once back in America, Sidney writes hundreds of letters and contacts dozens of relief organizations, all in the hopes of saving his good friend. Pran, meanwhile, is suffering daily tortures at the hands of the Khmer Rouge. Pushed to the breaking point, he makes one last-ditch effort to escape, pinning his very life on a plan that has little chance of success. The fact that The Killing Fields is based on actual events is remarkable, and even if there was some embellishment on the part of the filmmakers, the emotion and fear that results from Pran’s harrowing tale of survival comes across as 100% genuine. I found myself totally immersed in this man’s story, and the performance by Haing S. Ngor was a big reason why. Himself a survivor of Cambodia’s Killing Fields, Ngor successfully conveyed his character’s courage in the face of adversity, and, in so doing, became the obvious choice for that year’s Best Supporting Actor Oscar. Also quite deserving was Chris Menges’ Academy Award for Best Cinematography. Despite all the turmoil and internal strife, Cambodia was (and is) a very beautiful country, and Menges managed to strike the perfect balance between the area’s natural beauty and the chaos that the war inflicted upon it. The Killing Fields captured my attention and stirred my emotions. It is a visually brilliant, expertly acted movie, and if you haven’t seen it yet, you must do so immediately.